Are you a yoga lover looking to rejuvenate your spirit and re-energize your body? Are you ready to experience healing, expansion and cultivation of your life force? Do you want to be more authentic, transparent and real? Are you called towards deeper connection and compassion with yourself and others? Then join Carla and an amazing group of like minded adventurers for a 7 day YOGA & SPIRIT RETREAT February 23 – March 2, 2019 at the gorgeous Ayurvedic spa Villa Ananda in gorgeous Punta de Mita, Mexico! Beat the winter blues with 7 nights of pure bliss, fun and adventure as you relax and rejuvenate with this yoga immersion in a gorgeous beach setting on the Riviera Nayarit. This retreat is just what you have been looking for if you want to rejuvenate, slow down, heal your body and soothe your soul. Honour your journey as a human being and without judgement. 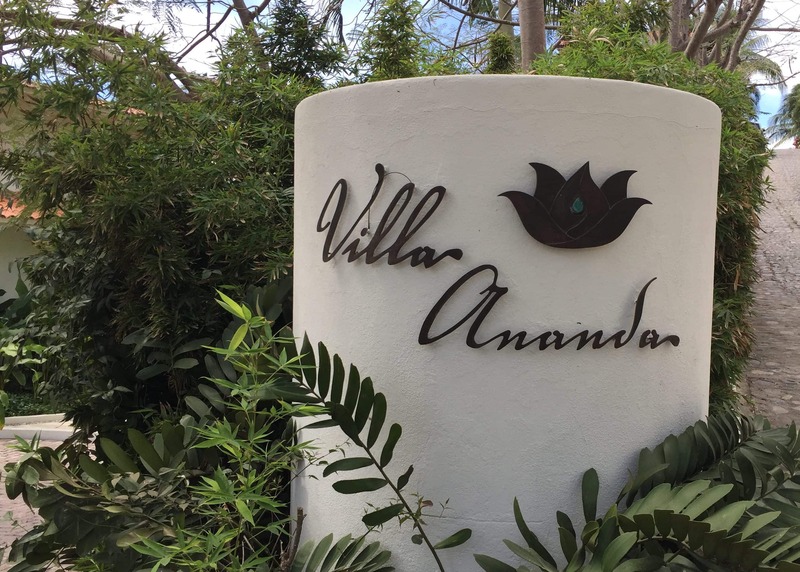 Villa Ananda is our destination! This private villa is located on the beautiful Mexican Nayarit Riviera, just a short distance from the well-known surf destination Punta Mita, and the quaint village of Sayulita. In addition to our nourishing yoga practices, we will enjoy a Temezcal sweat lodge, a shopping and cultural trip day to Sayulita, a massage, optional surfing, paddle boarding & Ayurvedic treatments, limitless fun and relaxation. This is my 13th year returning to this area and my annual Mexico yoga retreat is always one of my most popular offerings and guaranteed to be an experience of a lifetime. This year’s focus is Journey Into the Sacred where we will explore the tapestry and tradition of yoga through the insightful and transformational practices of asana, breath work, meditation and more. Our practices will include yoga asana, pranayama, Qi Gong, tantra, meditation and ceremony. Practices will be adapted for every body and every level. Envision waking up slowly, comfortable and carefree, the sun shining happily into your cozy and gorgeous digs. You put your favourite yoga pants on and step out into a paradise-like setting, with nature and wildlife surrounding you and a light breeze coming off the ocean, right at your doorstep. You start your day in silence and join the group for some meditation and pranayama (breath work). Then a light breakfast of fresh tropical fruit, yogurt, granola, cereal, tea and coffee with friends. Later in the morning you enjoy an energizing yoga class that focuses on pranayama (breath work), flowing standing sequences, and core strengthening. Afterwards, feeling rejuvenated and strong, you sit down with your new found friends (or old friends in some cases) to enjoy a specially prepared vegetarian Ayurveda lunch. As the day continues, the hardest decision you will have to make is whether you want to relax at the beach or pool, go surfing, snorkelling, paddle boarding, whale watching, explore the surrounding area, enjoy a fabulous massage or take a siesta. Later on, after some fun in the surf and sun, you will slip back into those yoga pants for another yoga class that is deeply restorative. Once we are finished, you enjoy another Ayurvedic meal in great company and possibly some meditation later on. After the sun goes down and you back in your sumptuous bed reflecting on your day, you drift off to sleep effortlessly, knowing that tomorrow brings you nothing but peace and tranquility. Punta Mita is a fishing village and luxury resort on Mexico’s Pacific coast. A stunning, jungled mountainous peninsula tumbles into the sea on a small peninsula on Banderas Bay. Offshore are the biodiverse Marieta Islands, with wildlife such as humpback whales and blue-footed boobies. To the north is the laid-back surf village of Sayulita (which we will be visiting!). The beaches that grace the coast from here to Nuevo Vallarta – part of a larger 150km stretch known as Riviera Nayarit – are some of the best on the central Pacific coast. The water is almost always clear and aquamarine, the sand is white and the surf can get fun too. Punta Mita is surrounded on three sides by nine and a half miles of Pacific Ocean beaches and coves including Litibu Bay. Punta Mita is at the same latitude as the Hawaiian Islands. It is kept comfortable year round by gentle sea breezes, with average summer temperatures around 85 °F (29 °C), and 75 °F (24 °C) during winter months. We welcome you to the tranquil paradise of Villa Ananda for your Yoga Retreat. Our space is very distinct from most retreat centers. Being a private beach front Villa located in secluded neighbourhood of 35 homes, guests feel wrapped in the lush tropical arms of nature, cared for by the hands and hearts of conscious staff and therapists. The intimate yet spacious grounds allow guests to interact together and spend time alone as desired. The pictures don’t quite do the space justice. We constantly hear how guests are awe struck by the tranquil beauty and attention to detail all throughout. Come enjoy! Villa Ananda is both a sanctuary and a very energized space. The comment received by guests the moment they walk in is, “ah, it’s so peaceful here.” There is a seamless flow from inside to out; fountain, bridge and garden inside, palm studded patio, pool and ocean view from every space outside. Great attention is taken to detail in decor, caring for the grounds and likewise caring for our guests. An amazing team of workers care for us all. There are a number of gorgeous suites at Villa Ananda. Some are on the main floor, others on the rooftop. If you have a preferred room, I will do my best to accommodate your wishes. You can also check out their website for more images of their beautiful rooms, grounds and everything else that they have to offer. Breakfast is beautiful continental cuisine daily: fresh tropical fruit, yogurt, granola, cereal, tea, coffee, may include hard boiled eggs; last day of retreat Mexican style Brunch with eggs available. *On Wednesday we will have an optional trip to Sayulita for the day – meals out are not included. Ginger is a natural antibiotic. It also helps with digestion if you eat a few slices of fresh ginger about 10 minutes before your meal. This helps fuel the “fire” in your belly, which can then more easily digest your food. Don’t drink liquid during your meal, as it puts out the digestive “fire”. Some foods should not be mixed, as it’s harder to digest, such as sweet and savory, or raw and cooked. These should be eaten at least an hour apart. Everything in health begins with digestion. Cilantro will help with skin and acne, and natural chelation (ie. it pulls toxins and heavy metals from your body). Helichrysum is good for getting rid of scars. It’s a common medicine used in Mexico, and it’s effective. Turmeric pills will help with digestion and overall health. Drink a jug of water every day. Add some lemon to make it detoxifying. If you’re weaning yourself off of sugary drinks, you can sweeten it with honey or maple syrup. When foods are as close to their state in nature as possible, that’s when they deliver the most potent nutrition. My goal is to offer you a luxurious yoga retreat at a reasonable cost. I offer three price points (super early bird, early bird and standard) and I encourage you to take advantage of my early pricing discounts. In order to be eligible for any early pricing, the applicable full amount must be paid by the end of the special (i.e., Early Bird pricing must be paid in full by November 15th). All prices are in USD. I accept credit card and PayPal payments – for anyone paying with cash or by US Cheque or Money order, I will offer an additional 2% savings. I know budgets can sometimes be tight, but I don’t want this to stand in your way. If you’re really committed to being a part of the retreat, but just can’t quite afford it, I do have a limited number of scholarships available. To apply for a scholarship, just send me an email to carla.wainwright@gmail.com and tell me a little bit about your situation. Please note that you are only eligible for a scholarship once. It is your responsibility to read and understand my cancellation policy. No one books a retreat with the intention of cancelling it, but unexpected events do occur and we encourage you to purchase travel / cancellation insurance to cover any unfortunate eventualities. Please note that because this retreat has limited numbers, it allows for a more personable, intimate experience, our non refundable cancellation policy is in place to ensure the highest quality of service and experience for all. Exceptions cannot be made for any reason, including weather, injury/illness, or personal emergencies. No refunds for arriving late or leaving early are available. Deposits are non-refundable. Although 50% of deposit can be applied to another retreat with Carla within a calendar year. The final payment must be made 45 days before the retreat which begins February 23. If you sign up for the retreat within 60 days of the retreat starting full payment is required as soon as possible to secure you place. Contact me for any further inquires about my policy. Who Should Attend This Yoga Retreat? All levels of Yogis are welcome! Everyone moves at their own pace and I will ensure everybody is accommodated. There are no expectations during this yoga retreat; do as much or as little as you want. This is YOUR retreat! Top 5 Reasons to Not Miss This Retreat! Being on retreat is about focusing on you. Practicing your yoga, eating healthy foods, slowing down and finding much needed restoration, relaxation and rejuvenation is so important. It helps remind us of what is most meaningful in our lives. The result? Getting inspired, hopeful, lighter and open to the possibilities in life! Our lives are incredibly busy and finding the time to practice yoga, or anything else, can be challenging. A committed week could be just what you need to rededicate yourself into practice and deepen your experience in breath work, asana, meditation and philosophy. Practicing every day you will notice the changes not only in your physical body, but in your mental state as well. Coming home afterwards, you might even be inspired to start a new home practice or take your existing practice to a new level. When a group of people on a similar path get together in a beautiful place, new friendships are bound to happen! It is incredibly inspiring to surround yourself with like minded people from around the world and practice together. Coming together like this in community is sometimes the perfect mirror to remind us that, although everyone is unique, we are all connected. When we step out of our regular lives, we can invest our time into contemplation, setting intentions for life, turning obstacles into opportunities and visioning our dreams. Experiencing the unknown is an accelerated way to grow and learn. You will have the luxury of time to do just what you want to do. perspective changing guaranteed! We can always come up with reasons or excuses for not doing something for ourselves. We often find it easier to do for others without ever stopping and providing that same nurturing for ourselves! You, more than anyone else, deserves to be treated and taken care of. When we are happy, healthy and inspired, we can lead by example for others. Make this investment in YOU today, it will be one of the best decisions you ever make.